Gold-tooled green morocco with silk doublures by Derôme le Jeune. Duc de la Vallière (? ); Justin, Comte de MacCarthy Reagh; De Bure Frères, Paris; Robert Lang, London; his sale, London, R.H. Evans, Nov. 17, 1828, lot 212; Sir Thomas Phillipps (Ms. 3669); Katharine Fenwick; Thomas FitzRoy Fenwick; Alan George Fenwick; D.M. Colman; purchased in Aug. 1955 from Charles Stonehill Inc., New Haven for William S. Glazier (1907-1962), New York; deposited in the Pierpont Morgan Library by the Trustees of the William S. Glazier Collection in 1963. 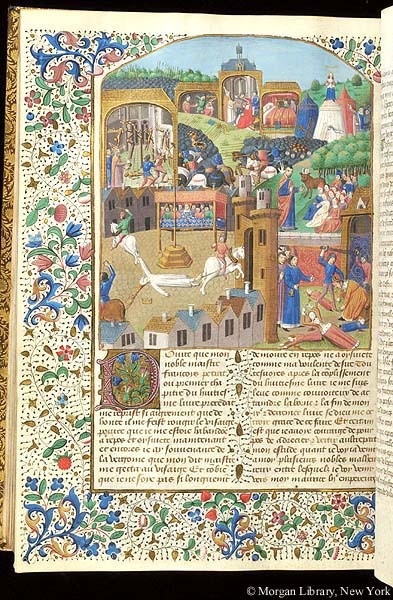 Ms.; written and illuminated in France, probably Tours, ca. 1480. Translation into French by Laurent de Premierfait. Decoration: 9 large miniatures, illuminated borders, numerous illuminated initials.